Southern district honors accomplishments in community WASH development. Administrators and community development representatives from the southern Bule Hora District officially recognized Lifewater’s effectiveness in the Borena Zone to help families, schools, and communities get safe water and improved sanitation. Arriving in the form of a Letter of Thanks, the recognition follows a two-year program with Lifewater partner DASSC to reach remote, rural communities in the arid southern region of Ethiopia. The Borena Zone in the Oromia Region of Ethiopia covers a large area in the southern end of Ethiopia, bordering Kenya. Communities in Borena often depend on small farms and livestock that suffer from frequent droughts. Over half of the rural population of Ethiopia does not have safe water, and over one third still practices open defecation. Families must move during the year to any place where they can find water, making education almost impossible. The letter cites over 12,800 community members benefitting from new or repaired safe water sources, as well as schools whose students and teachers now benefit from blocks of VIP latrines. Entire communities are now stable and healthy enough to build their own schools and their children are the first to attend in the family. In late July 2016, the representatives of district departments (Water, Health, Education, Women’s Affairs, and Administration) participated in the quarterly program review meeting and visited some of the project outputs in selected kebeles [village clusters]. They were thrilled by the attitudinal changes of local communities towards WASH and by safe water supplied to the neediest communities, tariff collection, and management and transparency, as well as the quality of the program. 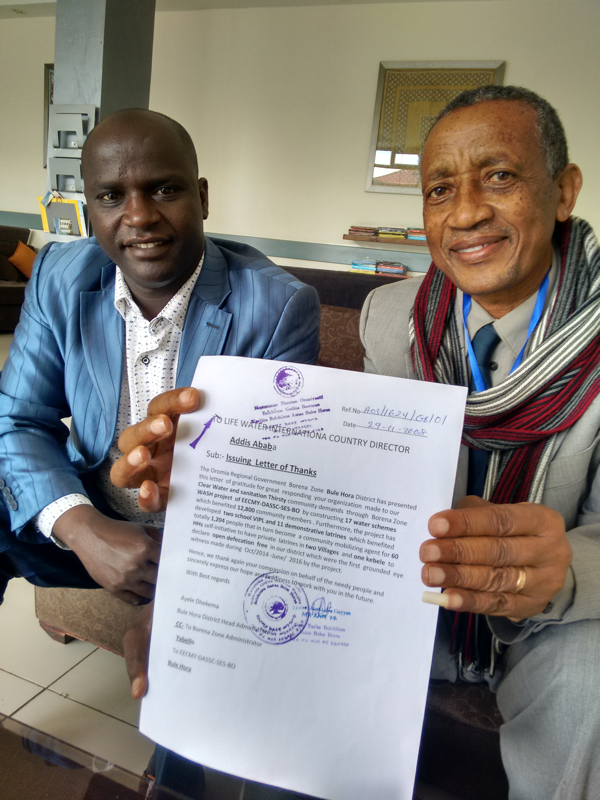 The DASSC leaders, Mr. Yishak Yohanis, president of South Ethiopia Synod of EECMY and Mr. Abebe Ware, DASSC Branch Office Director promised to deliver the letter and finally brought it to me in Addis Ababa. “We will continue to see the ripples of this change spread throughout the region, whether in WASH or in other areas where these empowered communities are ready to work,” added Narducci.